Q. Talk about playing from behind in a series. STOLL: Yeah, you don’t want to get in that position, but we have a couple times. Obviously we’re in it now. You just play the games. You’re prepared to win. Sometimes it doesn’t always go your way. Our group, we’re not going to get rattled. We’re not going to get down. We’re not going to turn on each other. It comes from our coaching staff, our leadership group, all the way down our lineup, it’s just a strong group that way. Sometimes when you’re going through a playoff series, you can easily see cracks probably not after Game 1, but maybe Game 2, 3, 4, you can see cracks in teams, and then you push at them until they’re done. With our group, I don’t think we have any of that. I haven’t seen any of that in all the playoffs that I’ve been a part of with the L.A. Kings. It’s a strong group to be a part of. Hopefully we can keep that going. Q. Jarret, how far back did this team learn to live like that? I’m sure the confidence hasn’t always been there? Was there a turning point or a series where it was like the light bulb went off for this group? STOLL: The one two years ago was pretty special. To be up 3-0 in every single round is, you know, tough to do. We got lucky. We got fortunate in a lot of those situations. We gained a lot of confidence from that, realized we can go into tough buildings and win this year as well. San Jose and Anaheim had arguably the top two, three, four best home records this year. We went into those tough buildings and won. Chicago is no different. A tough building. We’re going to have to figure out a way to win Game 2 and move on. Q. Jeff, going back to your linemates, do you feel suddenly old? CARTER: I’m sure I do. You’ll have to ask them (laughter). Yeah, I mean, it goes quick when you’re in this league. Seems like yesterday I was that young guy kind of going out there and just wheeling around and playing hockey, having fun. You can definitely see that in them when they get the puck and they create chances, they put the puck in the net. Tyler scores last night, you see them laughing at each other. They have a blast out there. It’s a lot of fun. Q. With Tyler, you had some success last year in the series. You’re both players who can shoot and make plays. Any particular chemistry that because you can both pull the trigger and shoot, you have had some success against Chicago the last two years? CARTER: I mean, he’s a confident player. He had success last year in the playoffs. He’s played well against them this year. I think everybody has those kind of teams that they feel comfortable going out and playing against. Usually have their best games against. Probably for Tyler, that’s fitting here in this series. He’s a guy that has great skill. He’s got speed. He’s got obviously a great shot. You know, he puts it all together, he’s a great player out there. So hopefully he can keep it going. Q. Jeff, as a guy who doesn’t need a lot of chances to score, can you talk about the Hawk’s ability to do the same? CARTER: Yeah, I mean, you look at their roster, they got a lot of skill up there. Their top six are pretty strong. You give them odd-man rushes, turnovers in the offensive zone, there’s a pretty good chance they’re going to end up in the back of the net. That’s something we definitely need to limit. We know that. We’ll get better at it. 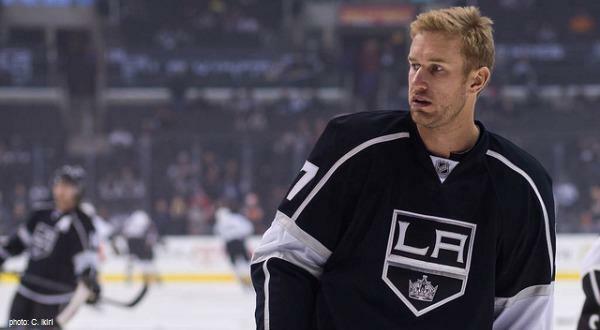 Monday comments from Marian Gaborik and Justin Williams can be found here. Plus, comments from coach Darryl Sutter were posted here.